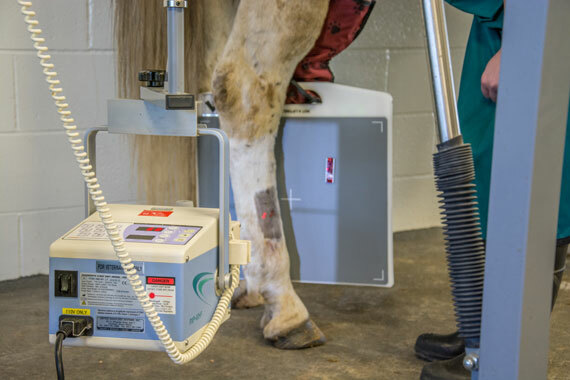 Lameness in the equine patient is one of the most common causes of poor performance. 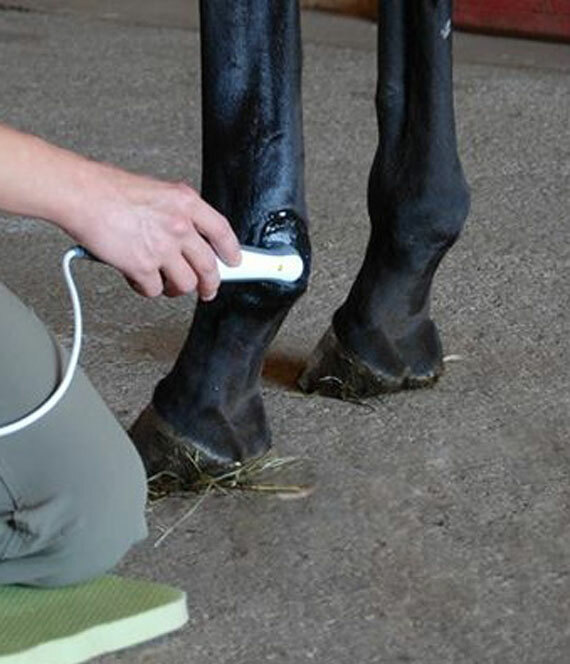 Lameness can be caused by pain, mechanical dysfunction or neurologic disease. 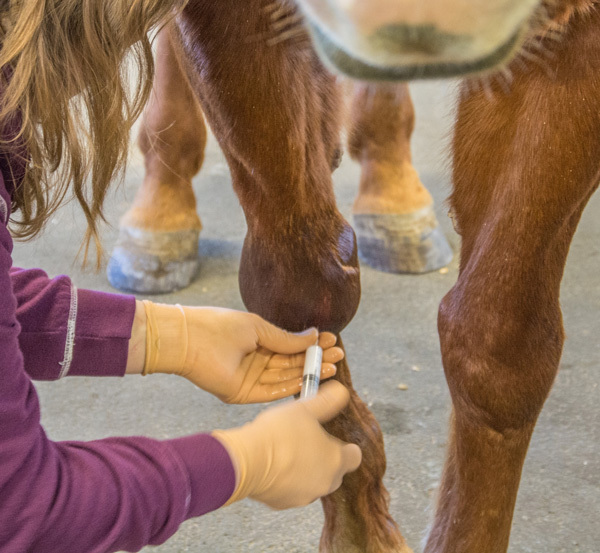 When lameness occurs, it is important that your veterinarian evaluates your horse promptly. This can save you time, money and frustration by diagnosing and beginning treatment immediately, to prevent further damage and begin the recovery process. 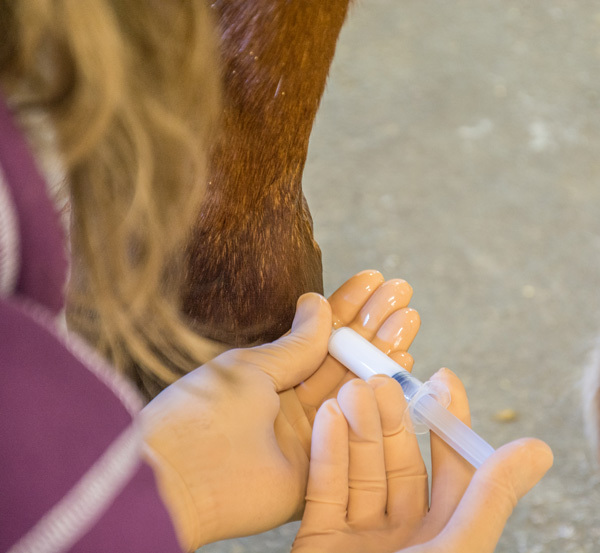 It is important to correctly identify the cause of a horse's lameness, because treatment will vary depending on the cause. 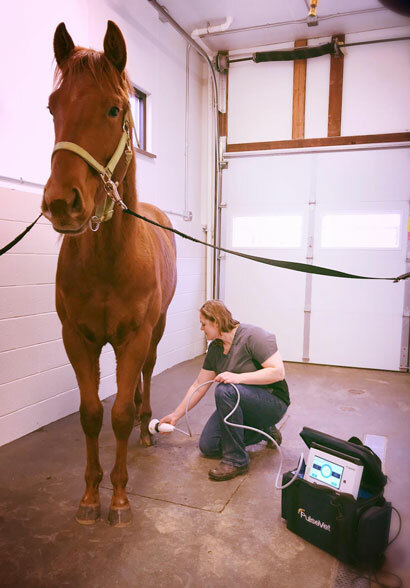 Our veterinarians use the latest equipment and medicine to diagnose and treat your horse's lameness problems. 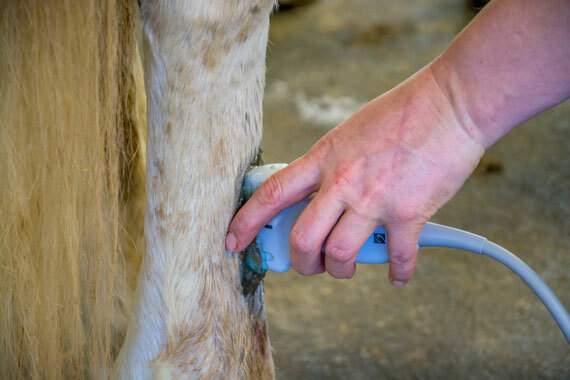 We perform a thorough lameness examination on your horse and recommend further diagnostics or therapies depending on what issues your horse has. With trained eyes and hands, your veterinarian will perform a passive exam by visually assessing the conformation and balance of the horse, as well as palpating the musculoskeletal system. Your horse will then be evaluated in motion and, depending on the case, possibly under saddle. 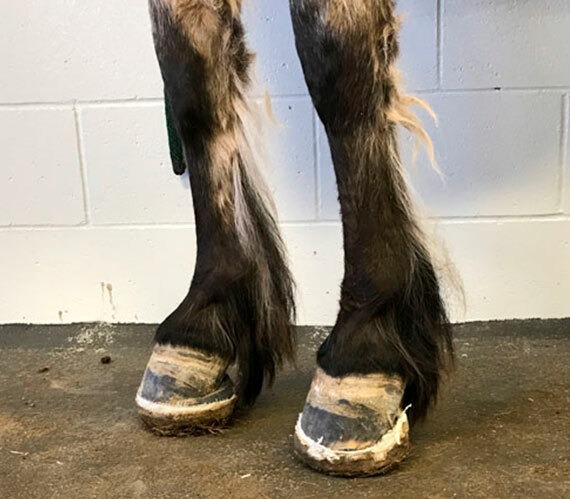 Your veterinarian will watch how the horse's feet land, abnormalities in the pattern of footfall, signs of pain when each foot lands, and asymmetry in movement. We utilize flexion tests which put stress on specific joints, and occasionally use diagnostic nerve and joint blocks to numb certain areas to localize the area causing your horse's discomfort. Once the region has been localized, our veterinarian will utilize radiographs, ultrasound and/or digital thermography to visualize the lesion. In some complicated cases, advanced diagnostics at a referral hospital, such as nuclear scintigraphy (Bone Scan) or magnetic resonance imaging (MRI), may be necessary. 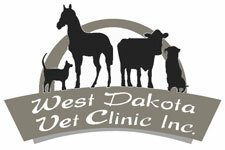 Your veterinarian will work with you to provide you with the best possible lameness exam and therapy. Our goal is to get you and your horse back in the saddle as soon as possible. Laminitis is one of the most dreaded equine diseases for horse owners and veterinarians alike. Laminitis is inflammation or failure of the laminae in the hoof. Laminae are soft tissue connections running between the hoof wall and the coffin bone. When they break down, this allows the coffin bone to rotate, and possibly sink, in relation to the hoof capsule. If diagnosed early, these changes can be slowly corrected with therapeutic farriery. Laminitis can occur from inflammation, such as colitis, peritonitis, retained placenta and carbohydrate overload, to name only a handful. Horses will be systemically ill (fever, dull/depression, possible diarrhea) and can develop laminitis, even if we treat primary symptoms. Endocrine disorders (hormonal or metabolic) are estimated to cause 90% of laminitis cases. 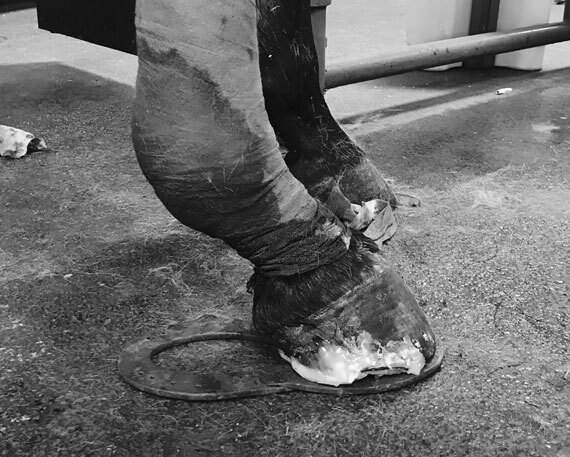 Pituitary Pars Intermedia Dysfunction (PPID), or more commonly equine Cushing's disease, and Equine Metabolic Syndrome (EMS) play a big role in laminitis. We can diagnose both PPID and EMS by blood tests. Once we are able to confirm either or both disorders, treatment involves specific medication for PPID and strict management changes for both. Our goal is to prevent laminitis before any symptoms arise. 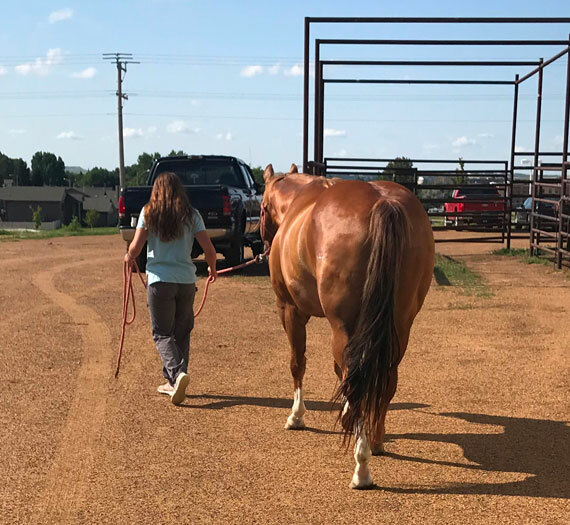 Our team will assist you in developing a plan for your at-risk horse, from testing for PPID and EMS to working closely with our in-house or your preferred farrier to develop a hoof care plan to make your horse comfortable. What is done in the first few days/weeks of a laminitic event can significantly improve the outcome, including recovery time, future soundness and quality of life. 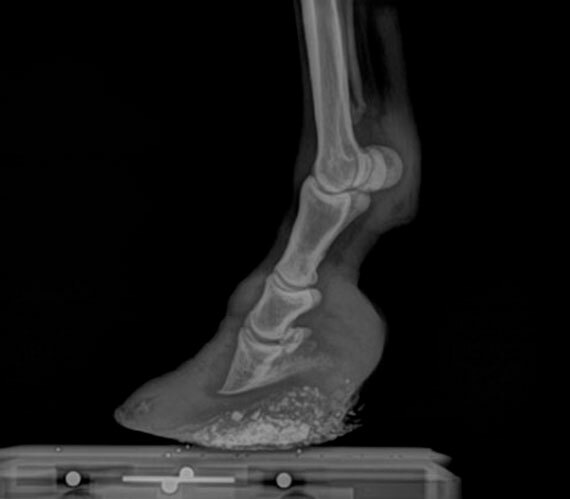 Venograms are diagnostic techniques that yield detailed information about the health of the blood supply to the hoof and internal structures to direct prognosis and treatment of laminitis. These are valuable monitoring tools, and along with early mechanical support, they show greater success of a positive outcome. 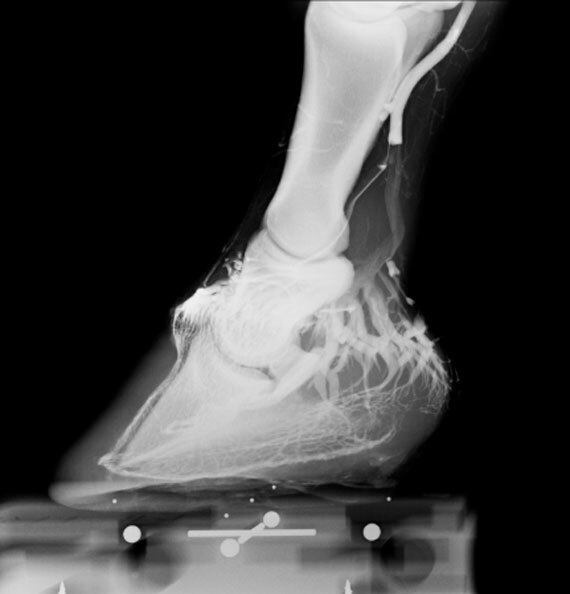 Equine podiatry is the understanding of the form and function of the horse foot. Combining information from a physical exam, radiology and ultrasound with therapeutic farriery, we can relieve and prevent foot problems. 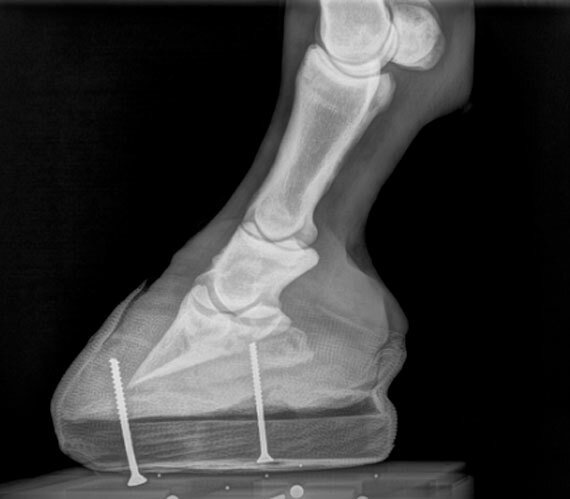 Podiatry treatments can be applied to help acute and chronic laminitis, acute and chronic heel and sole pain, hoof wall cracks or injuries, and white line infections. 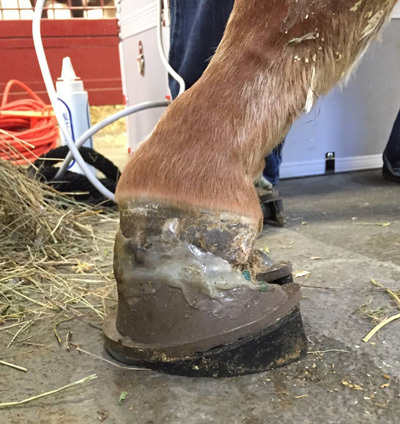 Therapeutic medications, hoof surgery, composite technology and glue-on shoes can allow for foot rehabilitation and return to normal use. We currently have a weekly schedule for our farrier, Tyrone Irons, at our facility. 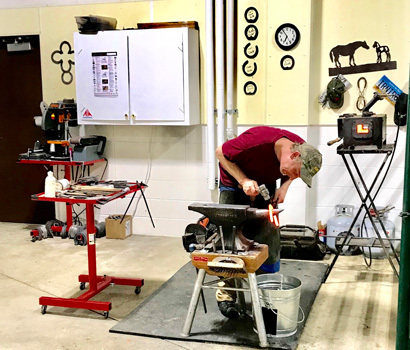 Our well-equipped farrier area provides a safe and comfortable atmosphere for routine, as well as complex, corrective shoeing procedures. 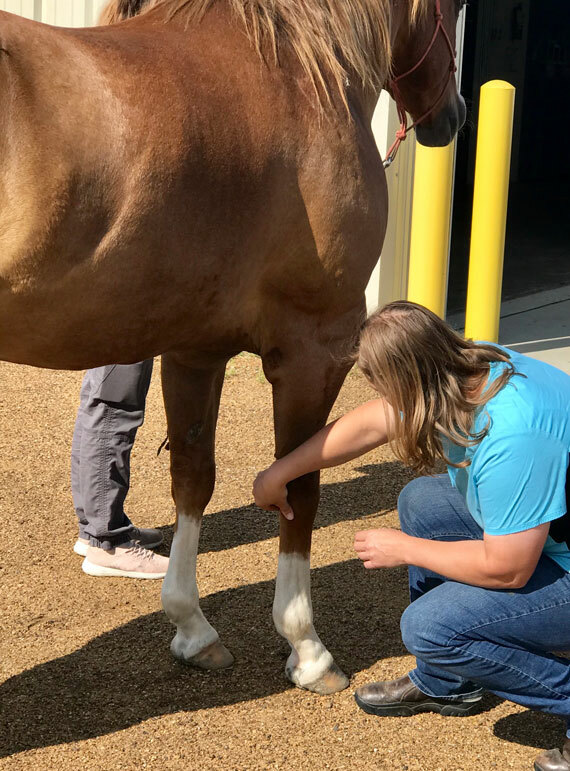 Staff veterinarians are available to provide sedation if needed, as well as medical consultation and digital radiographs pre- and post-shoeing to assist our farrier. The farrier is available by veterinary referral with a specific prescription or by client request. 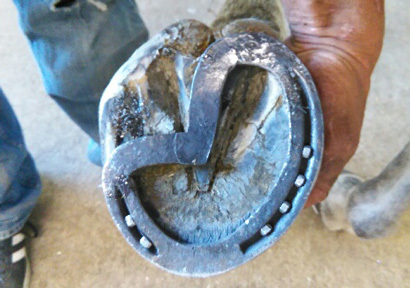 We also strive to work with your preferred farrier when needed to provide comfort to your horse. Our digital radiology processor provides superior radiograph images, able to be viewed quickly. 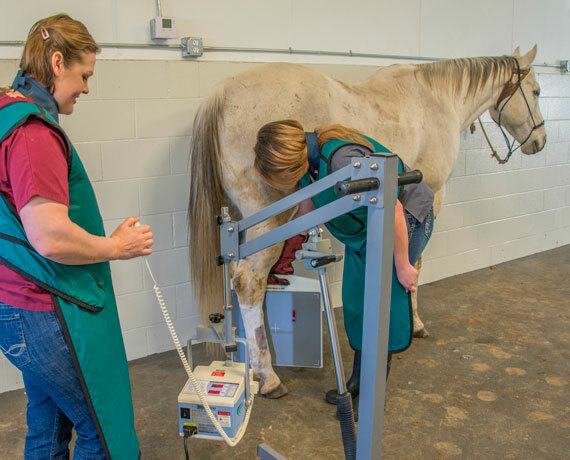 These machines can be scheduled for radiographic examinations, including pre-purchase exams, lameness work-ups and cases of trauma. The radiographs are available for immediate review with the doctor working on your case. Digital radiography allows for a more immediate diagnosis and helps us to assess, at the time of the visit, the need for additional views or exposures necessary to make an accurate diagnosis and allows immediate decisions to be made regarding appropriate treatment. The digital images produced by our Vetel Metron-DVM Software can be manipulated to provide optimal contrast and brightness, and can be stored and transmitted electronically. In addition, use of digital radiology for prepurchase exams can allow a more timely decision process and enhances the communication between the buyer and the examining veterinarian. Our digital SonoSite ultrasound machine provides excellent images of musculoskeletal structures, as well as abdominal and thoracic exams. We can also use ultrasound for specialty work, including ocular exams, umbilical examination in neonates, echocardiograms, etc. The images produced by our ultrasound can be shared with specialists if needed. 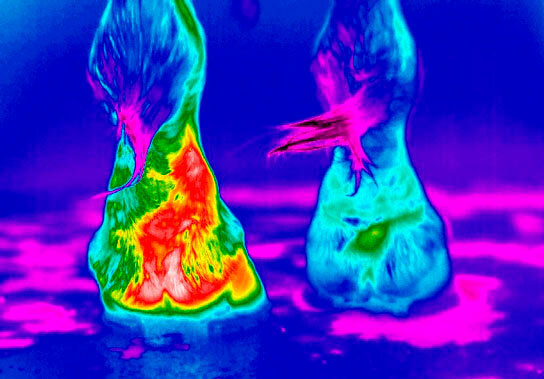 Thermography is a noninvasive, safe and cost-effective diagnostic imaging tool used in the health care of your equine partner. 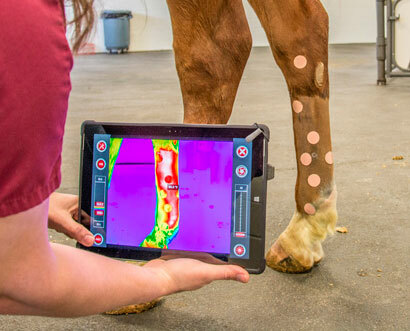 Thermography is the detection of heat distribution in structures or regions to precisely locate where a horse may be experiencing pain and inflammation. 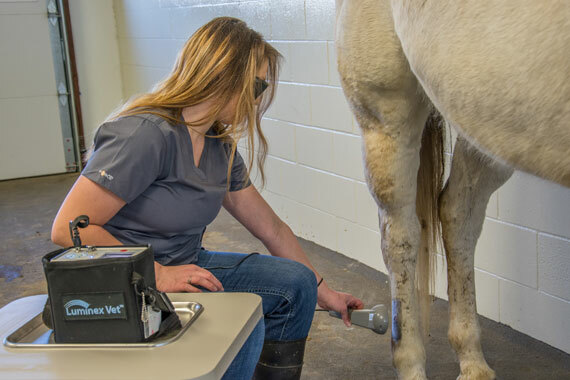 Our practice has a DIGITHERM IR thermography unit that we can use at the clinic or in the field to aid in saddle fit, determine where a horse may be experiencing pain after exercise, or better pinpoint a lameness. We also will often use our thermography unit during a pre-purchase exam as a subsidiary modality to ensure soundness. When horses perform at high levels their joints undergo increased stress and strain, causing pain, lameness and compromised performance. As joints are compromised, the fluid may become thin and discolored and lose its ability to adequately lubricate the joint. By supplementing the joint with hyaluronic acid via intra-articular injections, we can improve joint lubrication and decrease pain and inflammation. We offer a multitude of joint injection options. These options will be discussed in order to choose the most appropriate treatment based on your horse's assessment. 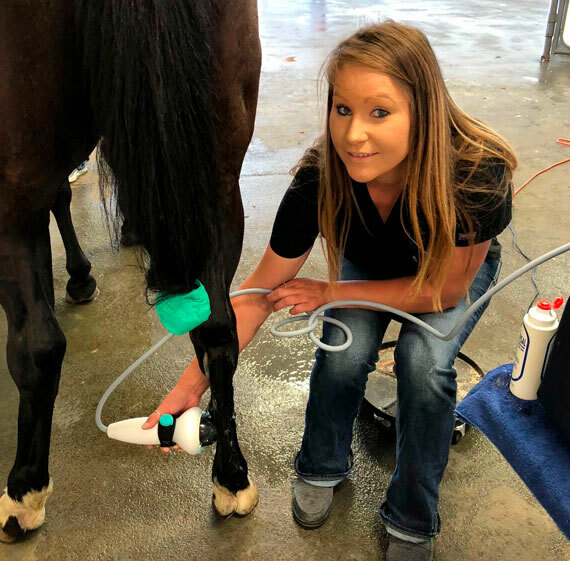 Extracorporeal shock wave therapy (ESWT) is an exciting new treatment that has been adapted from human medicine for use in the horse. The ProPulse machine generates a high-intensity pressure wave which travels through fluid and tissue to be focused at the site of the injury. Shockwave therapy has been found to be the most therapeutically beneficial treatment for injuries that involve ligaments and bone. These areas are often difficult to medicate, and unsuitable for surgery. Therefore, the non-invasive and focused attributes of ESWT have proved extremely valuable. ESWT has been shown to stimulate and accelerate the healing process. This is achieved by having an immediate analgesic (painkilling) effect and reducing the inflammation in the affected area. The type and location of the injury determine the energy required, the depth of focus, and the number of pulses the tissue requires. The horses are usually restricted to stable rest and controlled exercise between treatments. The horses are then re-evaluated. Post-treatment exercise levels are guided by the nature of the original injury and the improvement seen with treatment. We are particularly impressed with the ESWT's ability to provide pain relief for those horses with chronic conditions such as kissing spines, mild proximal suspensory desmitis, and pastern osteoarthritis. Therapeutic ultrasound is the use of certain wavelength soundwaves to warm and relax the tissue. 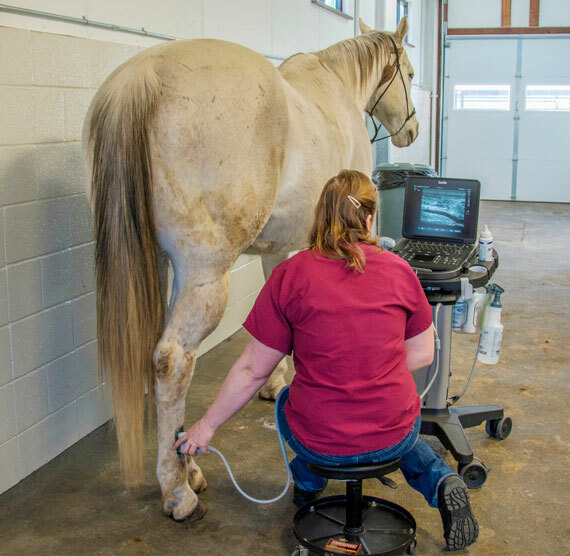 Our ultrasound produces a more effective and deeper action for a faster recovery in the treatment of equine muscles, tendons and joint structures. 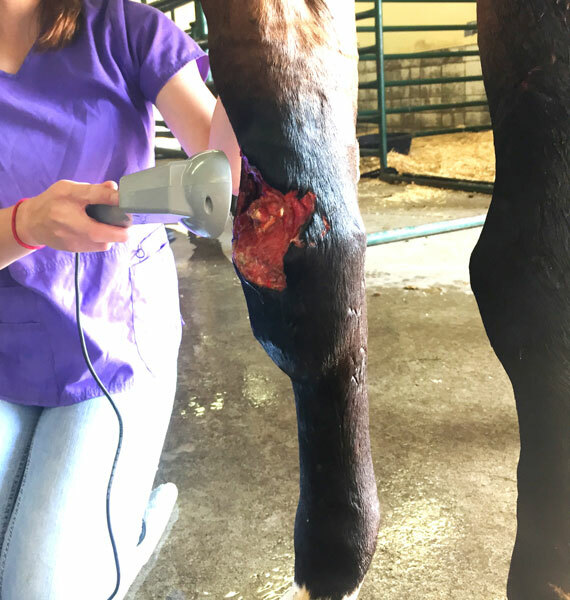 The ultrasound probe is applied to your horse's limb at a site of scar tissue, injury or inflammation, and delivers the therapy over 10-20 minutes. By mechanically stimulating the cells and warming the tissue, blood flow is increased, pain is decreased and healing is promoted. Cold laser is a state-of-the-art alternative therapy to assist with pain and healing. It can be used after surgeries to help increase blood flow to local areas, improving healing. It can also be used for chronic pain, helping to increase blood flow to those areas. This non-invasive therapy is painless, and treatment sessions last only 10-15 minutes.